TOUCHSCREEN DIGITAL JUKEBOX- just touch the screen to choose your song, no annoying buttons to press and NO gaps between songs!! 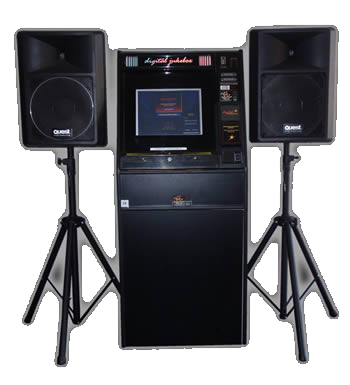 APPROX 5,500 SONGS of popular audio & video party songs - also available as a KARAOKE jukebox with 3,000 karaoke songs (see below). FULL-SIZE genuine jukebox - NOT a "home-made" box with a computer in it!! EASY TO USE - search by artist, title, genre/category ... plus our jukeboxes have a 'random play' function. GREAT MUSIC - Rock N Roll, 70's & 80's, 90's, Alternative, R & B, Rock, Pop, Country, Current, Dance & current Top 40 (updated monthly) ... all licensed music too, no illegal downloads. NEW MUSIC - Music is updated every month with current Top 40 music. IPOD option - please ask as you need to book this in to play some of your own music too!! NO GAPS - No gaps between songs! SOUND IS IMPORTANT! Includes two commercial 300 watt powered speakers on stands. These speakers are high quality commercial Quest speakers, which are powered/active speakers with balanced, XLR speaker leads. This combination means fantastic quality sound and extreme volume. Sound quality is important ... hire from DAJ. Check out our fantastic 'Lighting Pack Special' this month!! PLUS A FREE EFFECT LIGHT FOR OCT PARTIES! BOOK IT IN!